Nikki Jackson July 16 July 16 No Comments. The temperatures are rising and summer is upon us. Somehow 2018 is already half way gone – or half way left depending upon which side of the cup you are on. But that’s a whole other story. If you have been reading our blogs you will have noted that the topics have covered a wide array of subjects in the video industry, as well as, services that we offer which are beneficial not only to the broadcast video world, but to the corporate user and the personal consumer as well. We have digitally archived a wide array of media including analog tapes not only from consumer formats such as VHS, SVHS, 8mm, Hi 8mm, Digital 8, Mini DV, and HDV, but from former full broadcast and professional tapes as well such as ¾”, 1”, DVCam, DVCPro, Beta SP and Digi Beta . The subject matter has varied greatly as have the final destinations for the new digital video files. Retail consumers have digitized their home footage from analog tape to DVD and our corporate video clients have digitized and retained footage for archival needs, as well as, creating digital libraries for use on the web and social media. All of this is just for starters. We have also been busy making good on the blog topics in the video production and video editing realms. 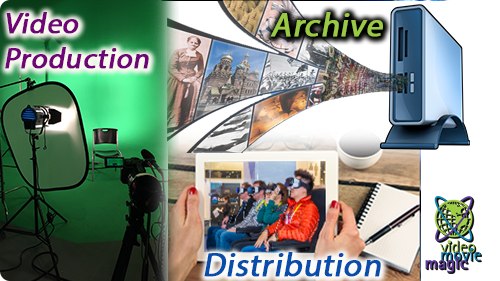 We have shot green screen videos, training videos, corporate training videos, video pieces for social media and live streamed time sensitive presentations. We have produced and edited all these video programs using the vast array of tricks we have available in our professional video edit bays. The finished products have varied in distribution from broadcast video files to television stations, streaming video for the web, digital video files for corporate intranet use and DVD and flash drives for wide spread distribution. Whew! Ring It In With Video Marketing!